Arriving at your home after a colorful journey through subtropical plantations, processing plants and roasting facilities, your coffee is a half-finished painting ready for your final touches. Now it's time to turn that aromatic bag of beans into an excellent shot of espresso! Before you start your shot, preheat your portafilter and cup by pulling a 'blank' shot -- run water through the portafilter and into your cup without using espresso. Warming will ensure that your shot's temperature is maintained throughout the process. One of the great things about making your espresso at home is how fresh it tastes, so capitalize on your coffee's flavor by freshly grinding your beans right before you pull your shot. The grind texture is a very important aspect of shot quality: If it's too fine, it will result in a slow, over-extracted shot that can taste bitter and burnt; if it's too coarse, it will be a fast, under-extracted shot with a weak and watery consistency and sour notes. The texture you're looking for is similar to granulated sugar, but this is just a rough approximation and you should experiment with your specific grinder and espresso machine to determine the ideal grind texture unique to your setup. Taking the time to calibrate your equipment is essential because no two grinders function exactly the same -- so even if you've just bought the exact same model of grinder as a replacement, you'll still need to experiment with it to find the right setting. Also, keep in mind that the more humid the weather is, the slower your extraction will be, so if the humidity in your region is prone to significant changes, you may need to adjust your grind on a regular basis. Another factor to keep in mind is the age of the beans themselves -- as they get older, they'll require a finer grind or firmer tamp. The dose is the amount of coffee grounds that you put into the portafilter for your shot. The proper dose for a double shot should be between 14 - 18 grams, depending on your espresso machine and personal preference. Take a look at your user manual for any tips the manufacturer provides in this regard. The tamp ensures uniformity of extraction by leveling and packing the grounds to ensure equal, consistent water contact as it is forced through the coffee. The proper tamp method is to hold your elbow at 90 degrees, rest your portafilter on a level surface and then apply 30 lbs of pressure until the coffee has an even and polished look. The pressure you use is ultimately up to you; the 30lbs of pressure is a standard in the commercial coffee industry so when mulitple baristas are using the same equipment, they will be calibrated correctly. If you're the only barista in your household, then calibrate your grind/tamp based on what feels natural to you. Coarser consistency will require a firmer tamp than finer consistency. Place the portafilter into your machine's brew group and put your preheated cup under it. Check your watch so you can time this shot -- a critical component of learning how to pull a perfect shot. Initiate the pull and watch carefully. If the dose, grind and tamp are ideal, the first part of the brew will be dark, then turn into a golden brown/foamy mixture (the crema) that flows into the cup in a thin, curly stream that is just strong enough to hold together. The volume of water for each shot should be 1 oz., so after your double shot has reached 2 oz., stop the shot and check your watch again. The brewing time you're looking for is between 20 - 30 seconds, so if you're running too long or too short, check your grind, dose and tamp, then adjust it accordingly. 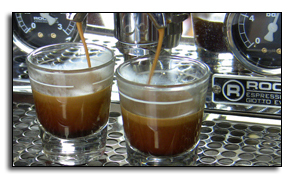 If your shots are coming out unevenly from both spouts, your tamp needs to be more even. You want to create a fine golden crema atop a rich dark brew that tastes sweet and smooth. It's well worth the time to experiment and learn how to pull the perfect shot from your espresso machine -- the result will be excellent espresso drinks every time. Are you more graphically-minded? Check out this Infographic version of this how-to guide.